"Puer natus est nobis ...."
After working weekends during the year, the volunteer crews took off the month of December, but a few men assisted in various woodworking projects for the FLC. The Feast of the Immaculate Conception fell on a Saturday, and the parish held an Advent Marian party of cake and punch on the following Sunday, December 9. As the weather was pleasant, we gathered outside at the staute of the Holy Family, which had been adorned with artwork from the first level CCD students. Fr. Van Vliet opened the celebration with a few remarks on the Immaculate Conception and a prayer for her intercession, then the intermediate level students sang the first stanza of "Ave Maria", after which everyone joined in. The following Sunday was Gaudete Sunday and Fr. Lockey gifted the parish with gingerbread and chocolate peppermint cakes. Poor weather outside; joyful party inside. Overcast but mild Christmas Vigil. Christmas carolling before Mass for the first time, thanks to the young ladies who formed a choir in September! More photos in Advent and Christmas, 2012 Photo Album located at the top of the page. Pro-Life and Pro-Family. In addition to the prayer vigils held each First Saturday at Planned Parenthood, the parish participated in a prayer vigil on September 30 as part of the 40 Days for Life Campaign. On October 13, parishioners attended rosary rallies held at noon at various locations around Houston in honor of Our Lady of Fatima and asked her powerful intercession in the battle against increasing secularism. The parish also sponsored a table at the Foundation for Life Gala on November 10 in support of maternity assistance for crisis pregnancies. October 21-30, 2012. Fr. Van Vliet was at the FSSP headquarters in Fribourg, Switzerland, to meet with his newly-appointed replacement as Bursar General. This transfer of Bursar duties followed his resignation in June 2012 as Third Assistant to the Superior General, and ends his international responsibilites. Both positions were held for the past six years. In his absence, Fr. Paul Lockey, pastor of our host parish, and Fr. 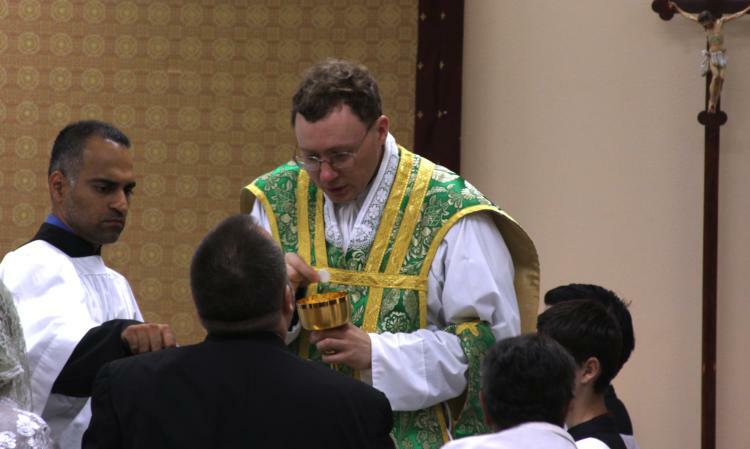 Robert Ferguson, FSSP, celebrated the Masses. Fr. Ferguson is Vice Rector and Dean of Men at Our Lady of Guadalupe Seminary. Read About Fr. Rbt. Ferguson, FSSP at the bottom of the page under Documents. Mater Dei, Regina Caeli, ora pro nobis. Sunday, Feast of the Most Holy Rosary: overcast, chilly, wind gusts and rain threats. Sun broke through the clouds by early afternoon but wind gusts continued. A particularly powerful gust toppled the processional cross and Fr. Van Vliet quickly repaired the damage as the faithful began arriving. Then the wind died down, the choir began leading the faithful in Marian songs, and a glorious and beautiful procession began in honor of Our Lady. Deo gratias! 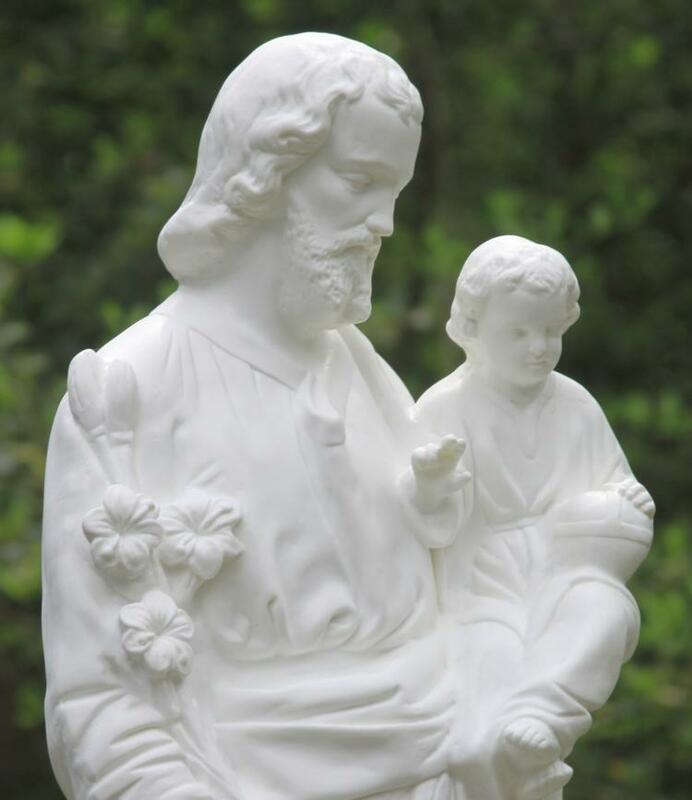 The rosary, said in English, Latin and Spanish, ended with the Novena Prayer to St. Joseph, invoking his continued intercession, and a blessing of the faithful. Then off to good eating and great fellowship! More pictures at Rosary Procession, Oct. 7, 2012 Photo Album located at the top of the page. July 1- 21, 2012. Fr. 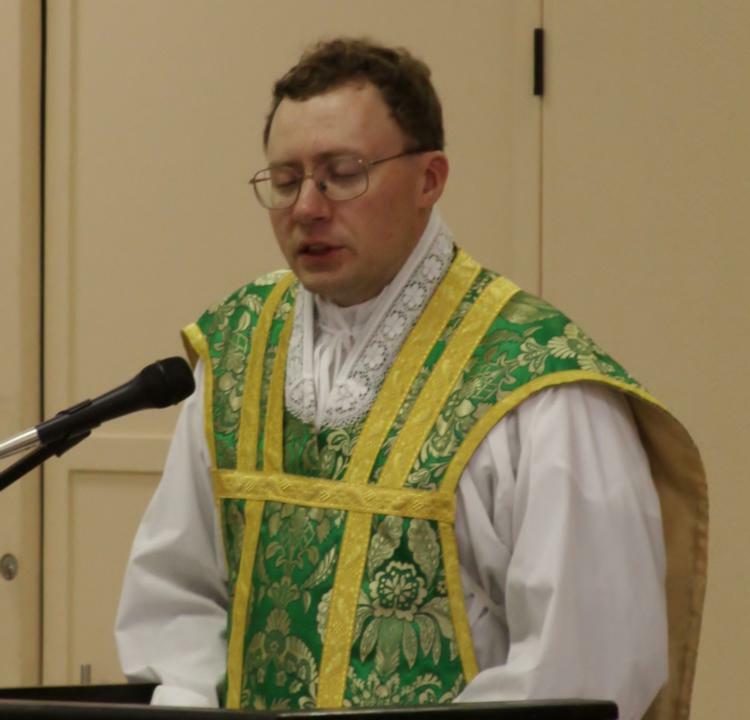 Van Vliet attended the plenary session of the General Chapter of the FSSP in Denton, Nebraska. Fr. 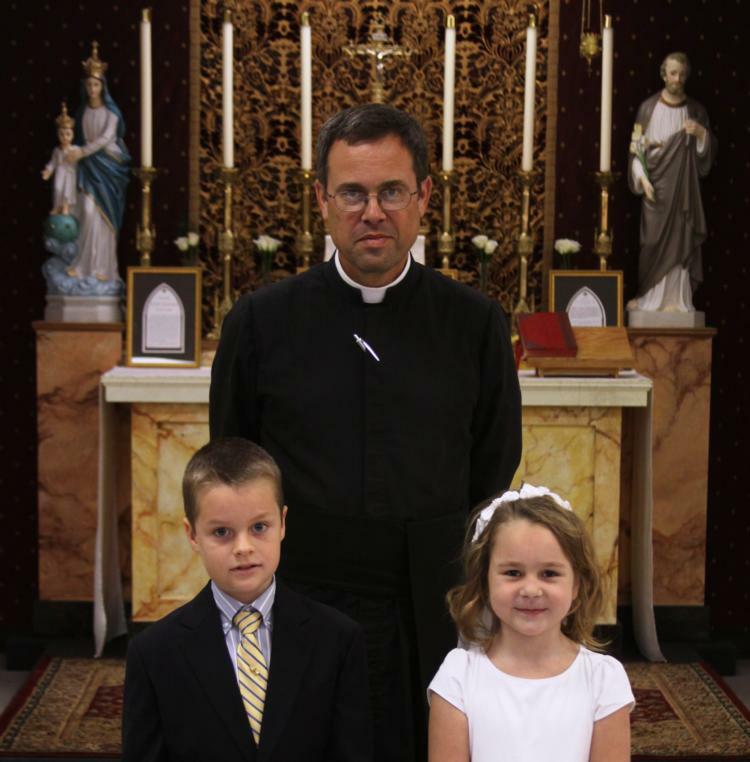 William Lawrence, FSSP, professor at Our Lady of Guadalupe Seminary, served as replacement pastor. His exposure to Houston: rain, rain, and more rain. Read About Fr. Wm. Lawrence, FSSP at the bottom of the page under Documents. August 2, 2012. 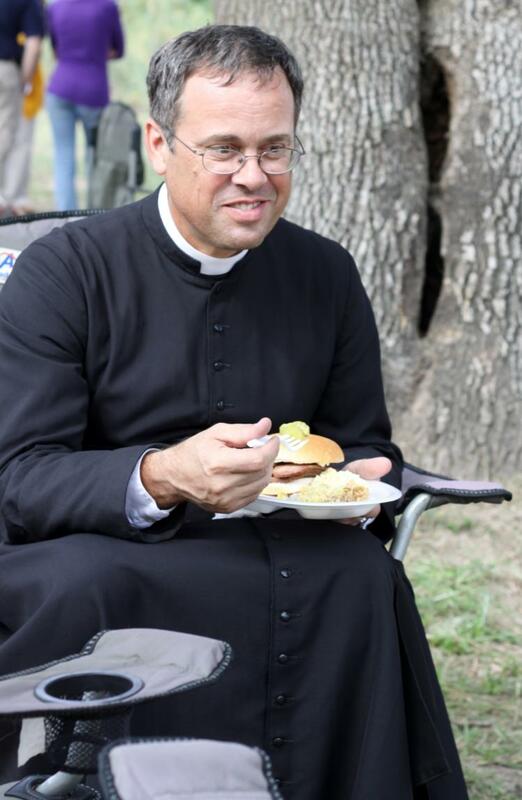 The Right Reverend Father, Dom Philip Anderson, Abbot of Clear Creek Monastery in Hulbert, Oklahoma celebrated a Low Mass in the Traditional Rite in the FLC and met with parishioners and supporters at a reception held afterwards. Ab. Anderson was in Houston for the Conference of Major Superiors of Men. Read About Ab. Anderson, OSB at the bottom of the page under Documents. asked by a young boy, "What is it like to be a monk?" Congratulations to Sam and CiCi! 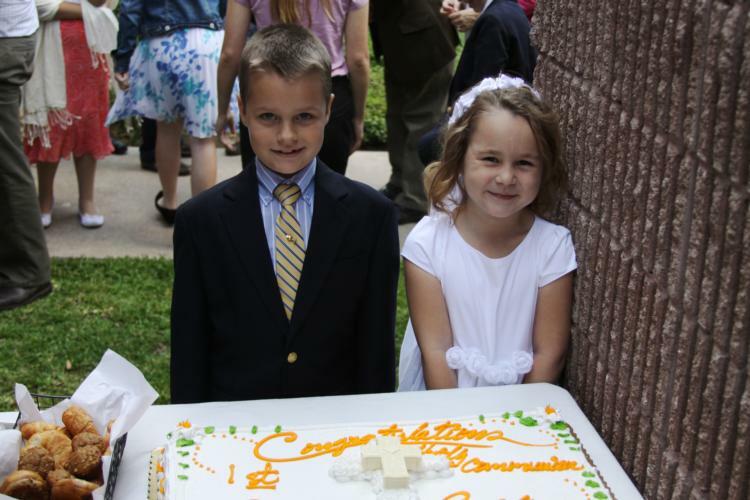 Their First Communion, on the Fifth Sunday after Easter, was also the first for the parish. On May 5, 2012, the Very Rev. 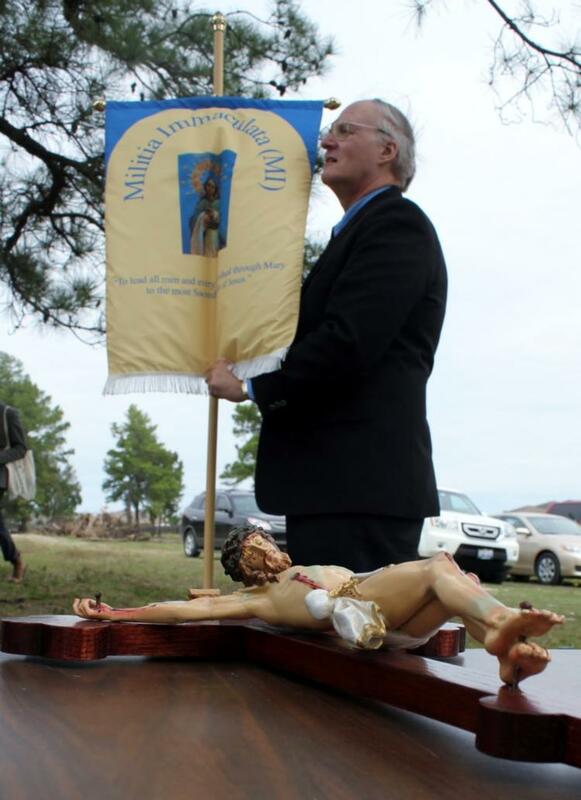 John Berg, Superior General of the Priestly Fraternity of St. Peter (FSSP), celebrated the official opening Mass of Regina Caeli Parish under an open-aired tent at the church site and blessed the grounds. Over 220 people attended the event, which ended with a Texas style barbeque dinner and piñata fun for the children. Once again, Fr. Van Vliet and the men of the parish spent several Saturdays preparing the grounds. On the preceding Friday, even Fr. Berg was put to work. Hot sunny day, but a joyful and blessed event. Fr. Berg&apos;s Sermon, May 5, 2012 at the Ground Blessing is at the bottom of the page under Documents. The next day, Fr. Berg celebrated a Traditional High Mass in the FLC and met with parishioners. Mass followed the May Crowning of Our Lady. First Communicants Ceci Haddox and Sam Morris carried the crown and flowers, respectively, and led the faithful in presenting the flowers to Our Lady. Read About Fr. John Berg, FSSP Superior General at the bottom of the page under Documents. More pictures at Fr. Berg Visits, May 2012 Photo Album located at the top of the page. A series of firsts in this the first Traditional Holy Week held in the Archdiocese in over 40 years: first blessing of palms and procession in the Traditional Rite, first Holy Thursday Mass celebrated in the Traditional Rite, first Good Friday service and first Easter Vigil in the Traditional Rite. Fr. Van Vliet had a first as well: It was his first time to sing the Passion of Our Lord on Good Friday. 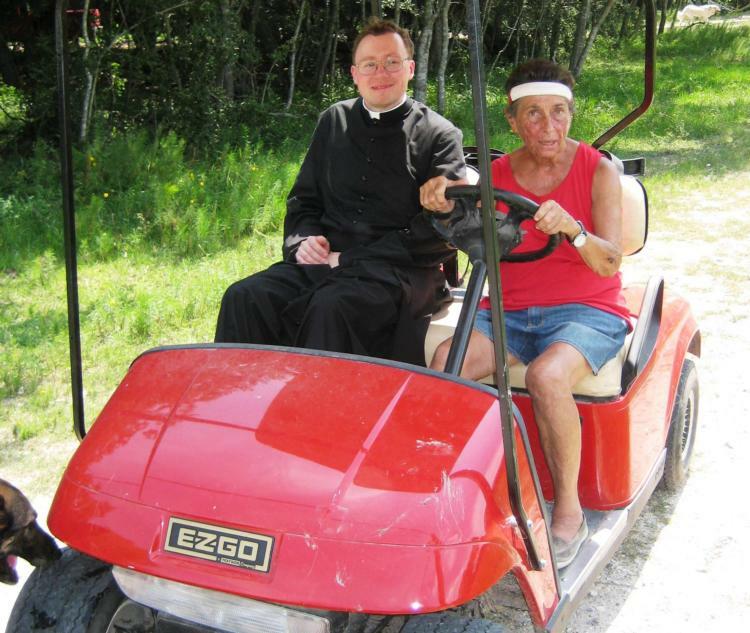 He was assisted by Fr. Crooker, an elderly Houston priest, who has fond memories of singing it as pastor in his younger years. Normally soft-spoken, his voice rang clearly and beautifully. Together the two priests, two cantors, and schola chanted the Passion of Our Lord as the faithful followed in their missals. The Family Life Center (FLC) itself underwent changes. A new altar crafted by parishioners under the guidance and assistance of Fr. Van Vliet was unveiled to replace the existing altar for the Holy Sacrifice of the Mass. The original altar was used as the altar of repose on Holy Thursday, and will be used on other occasions, as for example, at the blessing of the church grounds in May. Changes were also made to the kneelers used in the FLC; wood bases were added to the cushions to raise them off the floor for easier rising from a kneeling position. More Pictures at Easter Vigil, April 7, 2012 Photo Album located at the top of the page. Dedicated Sunday afternoon, the day before the feast day of St. Joseph, Spouse of the Blessed Virgin Mary. The site, future construction and capital campaign were entrusted to St. Joseph, whose powerful intercession will be needed as we move forward. The men of Regina Caeli worked Saturdays in February and March to prepare the grounds for the dedication. For many who came to the dedication, it was the first time to see the property. The children were especially thrilled by the four-legged residents. More pictures at Site Dedication, March 18, 2012 Photo Album located at the top of the page.